Residents released 25 turkeys into Tooele canyons as a result of efforts by the local chapter of the National Wild Turkey Federation. Today an estimated 600 wild turkeys live in the county, as opposed to none a decade ago. 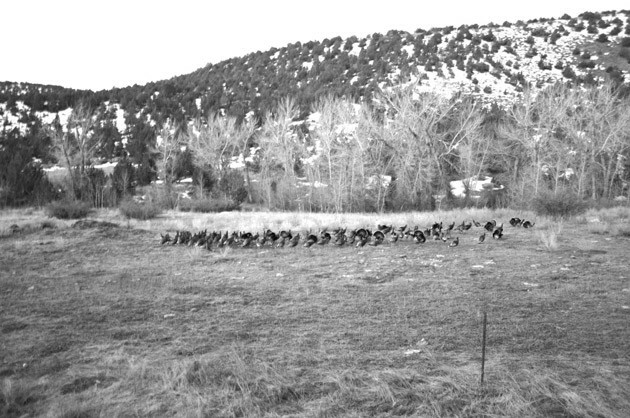 BYU students and professors studied the growing turkey population in Tooele County earlier this year. 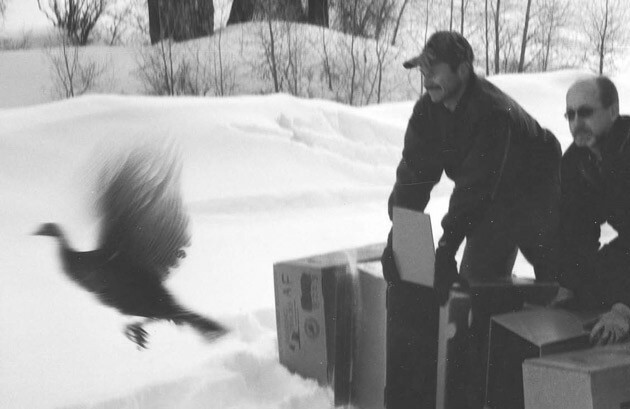 Two members of the local chapter of the National Wild Turkey Federation, Merrill Clarke and Tom Becker, release a transported turkey in Ophir canyon. Those who notice such things have seen more wild turkeys of late in Tooele’s canyons. The estimated 600-700 in the county is a big change from seven years ago when there where none. 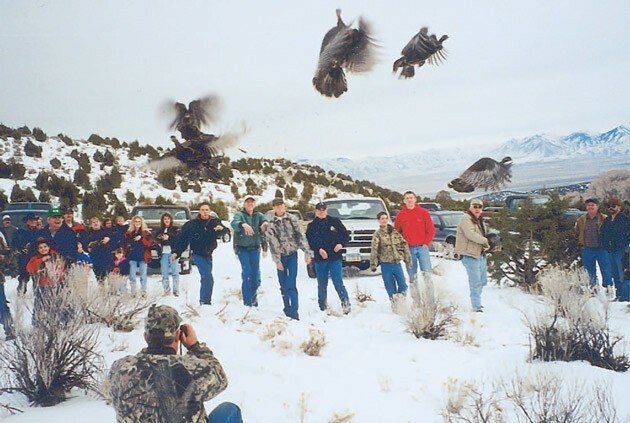 Paul Kaletta founded the Tooele chapter of the National Wild Turkey Federation (NWTF) about six years ago to help bring the birds back to Tooele. He first became interested in turkeys after he came across some of the birds in St. George while looking for deer horns. Since Kaletta started the Tooele chapter, members have offered their time and money to transport birds from other areas with surplus populations. For instance, two flocks of 15 brought in seven years ago have multiplied to approximately 150, estimated Tom Becker, a biologist with the Division of Wildlife Services and a member of the local NWTF chapter. The turkey was once native to Utah, but was killed off by the white man. American Indians not only ate the birds, but also used them for their feathers. 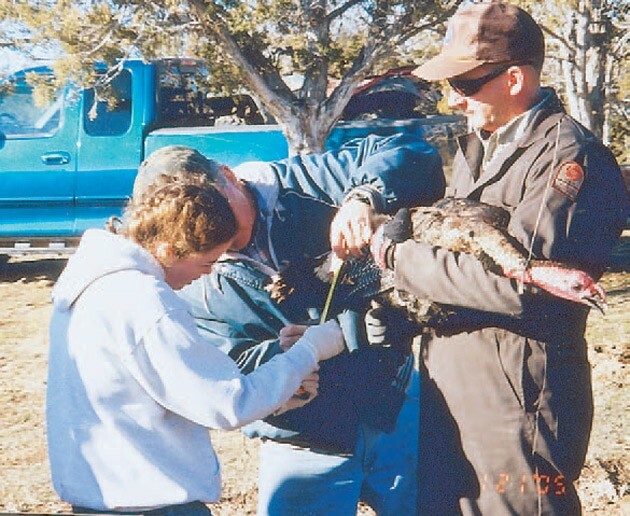 NWTF works to restore species to areas that were once their natural habitat. One result of that is turkey hunting has returned to Tooele County. Utah increased permits for hunters by 58 percent in 2005 and Tooele was close to the state average. “We’re not bashful to say we’re here to help the turkeys, but we’re also here to hunt,” Becker said. Many turkey hunters say a wiley intelligence is what makes the birds so fun to hunt, despite the silly reputation earned by fat domesticated turkeys. The wild American turkey was called “wild and wary to the point of genius” by author G. T. Klein. Benjamin Franklin wanted the turkey to become the national bird, on account of it having superior character to the eagle and great courage — just like the colonists who defended their rights against England. Turkeys have six times the hearing, 10 times the eyesight and 10 times the ability to detect movement as humans. To find one in the wild, experienced hunters get to know the terrain and track the animals paths getting to know their haunts. They also listen and learn to recognize their calls as well as their natures. Kalletta bought his first permit in the mid 70s to hunt in Zion National Park. It took a few years to get to where he actually harvested his first bird, which he said is pretty normal if you hunt them with true sportsmanship. 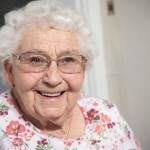 “You can drive around in a truck and probably get some, but the challenging way to do it is to call them,” turkey enthusiast Merrill Clarke explained. Clarke is a past-president of the local chapter and is currently a member of the NWTF state board of directors. It’s also safer to hunt turkeys with calls. It’s happened before that a novice hunter has heard more experienced hunters making turkey sounds to attract a male, and shot at them. Kaletta remembers one hunting experience. As he made female turkey sounds, he heard the male gobbling back to him for 500 feet. All of a sudden it got really quiet and he thought he’d lost the turkey, until he turned his head and found the large bird staring right at him from behind. He said it was an exciting experience. A Rush Valley resident, Clarke has gotten a feel for where local turkeys roost and their normal habits. As a result, in the morning as the first light appears in the sky or as the last light is leaving in the evening, he can lead the way to large flocks. The bird’s plumes are irridescent and beautiful in the sunlight. The male turkeys’ heads and necks change from red, white or blue or a combination of all three depending on their mood. Like many turkey hunters, Clarke uses all sorts of devices to make female calls and attract large turkeys. Clarke has some store bought calls, including diaphrams which help his whistle out the calls. In addition, he makes his own calls. Clarke carves out wood using special tools and when the lid is moved over the hollow substance below in different ways all sorts of turkey squacks and clucks are heard. In addition, he has pieces of bone that can be blown, textures that can be scratched with wood, and other unique devices to make calls. Many turkey hunters travel around the world to experience the joy of the hunt. There are six sub species of turkeys, only two of which have been introduced in Utah. Hunters in pursuit of what they call the World Slam have to travel throughout the United States and Mexico to harvest one of each of each type. Utah’s hunt is one of the hardest to participate in due to the low number of turkeys in comparison and high number of applicants. Louis Dunyon of Stockton has been hunting turkeys since the ’60s and has all six subspecies. 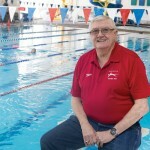 He is one of perhaps four in the state of Utah to achieve that goal. Tooele County has two turkey hunts a year between April 9 and the end of May. The first hunt is the most popular and the odds aren’t very good. It cost $45 for residents who drew this year. Only one turkey can be taken with a permit. Clarke applied for and obtained a permit in southern Utah this year. In addition, some members of the local chapter have helped others in Tooele with their hunt and will likely continue the tradition. Getting turkeys to Tooele has been an expensive process. Seven years ago, it cost $250 to transport a single turkey here from out-of-state. Today it costs $150 from out of state, but only $65-75 from within the state. This year no turkeys were brought in across state lines, as there were enough in state to place them where they wanted them. In-state moves are cheaper in part because the turkeys don’t require the blood tests needed to cross state borders. This year’s president of the Tooele NWTF chapter, Bob Pannunzio, has driven to and from South Dakota to bring back turkeys. 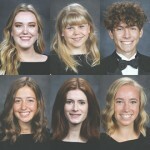 The effort is carried out mostly by volunteers and by funds provided by the chapter’s yearly banquet, which is coming up on March 19. “That’s our one fundraiser for the year,” Becker said. Tooele hosted the biggest NWTF banquet west of the Mississippi two years ago, with about 900 in attendance. This year the BBQ beef dinner is limited to 500 people, although others may join them at the Deseret Peak Complex afterwards for the auction. There are close to 500 local members. Pannunzio describes the banquet as family-oriented. Every kid that comes is guaranteed to win something and while the cost is $140 per couple for dinner, membership and $100 worth of raffle tickets, it only costs $5 for kids to attend the meal and another $5 for their membership. Tickets are available until they are sold out. There will be a live auction, a silent auction and a raffle with a wide variety of prizes, ranging from camping gear to a new patio set. There are general raffles as well as raffles specifically for women and children. Those in attendace can play their odds when they choose where to put their tickets. Other fundraiser games are also available. 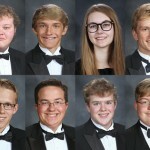 Tooele has the second largest chapter in the west. The NWTF is a nonprofit organization organization with nearly 525,000 members in 50 states and 12 countries. It supports scientific wildlife management on public, private and corporate lands as well as wild turkey hunting as a traditional North American sport. For more information contact Bob Pannunzio at 882-8558.